Jacana Camp is situated 25 kilometres west of Mombo, outside the Moremi Game Reserve on the Jao flats - a reserve of 60,000 hectares. Jacana Camp is a true water camp, becoming a small island surrounded by flooded plains when the Okavango Delta is at its peak flooding each year (usually from April to October). Guests will focus on water-based activities (mekoros, motor boats and fishing) during the high flood season but will also have the option of 4x4 game drives during the drier months when the roads again become accessible. Jacana Camp's five Meru-style tents are built on wooden decks to accentuate the views overlooking the floodplains. Each tent has an en-suite bathroom which is enclosed but roofless allowing for showers by starlight - or by dappled sunlight and shade. The camp has a plunge pool for cooling off in the midday sun. The main dining area is on an elevated platform between two magnificent sycomore fig trees and surrounded by dense wild date palms. Downstairs, there is a cosy bar and lounge with an area for an open fire under the stars. Complimentary laundry services are provided. Jacana camp and offers mokoro and walking safaris all year round. As the floodwaters recede game driving and night drives in open 4x4 land rovers are available from October to March. During the height of the floods, the activities at Jacana Camp revolve around exploring the waterways of the Okavango by mokoro (dugout canoe), motor boat and on foot. 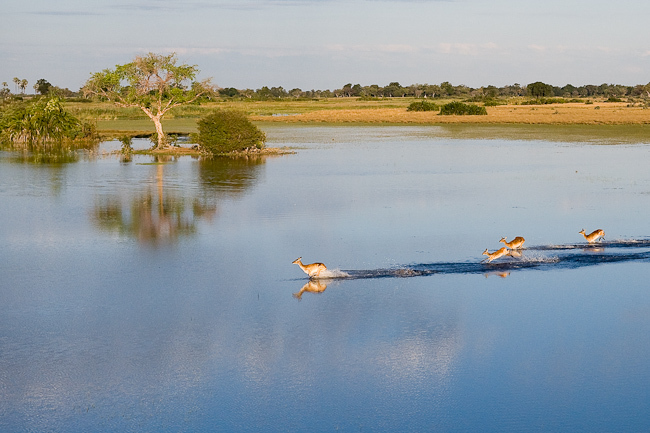 Traveling silently by mokoro is a wonderful way to experience the Okavango as you glide silently through the shallow flood plains enjoying the magnificent bird and aquatic life. One of the highlights is searching for the rare and elusive sitatunga antelope or to explore wooded islands to stalk the rare Pel's Fishing Owl, one of the largest owls in the world. Taking a mokoro ride to a distant island, then stopping for a lengthy walk before enjoying a leisurely brunch on a sandy bank is a good way to appreciate the true wilderness atmosphere and unique scenery and wildlife of the Okavango - with no one else around. Travel by motorboat, searching for the perfect fishing spot. Guests may also boat across the channels to take a game drive on the plains to the west of Jacana viewing large herds of Red Lechwe and often spotting predators in pursuit. In the dry season (November to March) vehicles can drive through the shallow sandy river crossings for game drives as well as interesting night drives. There are two platform hides in the concession. The camp is set in the most densely populated wetland area for Sitatunga antelope and Red Lechwe. Hippos and Crocodiles are regularly sited. In the dry season Red Lechwe, Tsessebe, Wildebeest and Zebra occur here, and Lions, Cheetah and Leopard are often sited on the floodplains. Larger mammals in the area can include Elephant and Buffalo. This is an area of prime importance for a host of wetland bird species, including Wattled Cranes, Pel's Fishing Owls, both species of Jacanas (African Jacana and the Lesser Jacana), as well as other seldom sighted species such as Rails, Crakes and Moorhens. The Jao Concession is 60 000 hectares in extent and is in the north-western area of the Okavango Delta below the Panhandle. The Moremi Game Reserve forms the eastern boundary of the concession. The Okavango rests between shallow fault lines at the end of the Great African Rift Valley. Deserts are low on annual rainfall and the Okavango Delta is no exception. However, each year floodwater flows into the Okavango from its source in the moist African highlands over 1000 km away. These floodwaters flow from their catchment southwards and into the Kalahari Desert to create a unique wetland that supports and sustains a huge diversity of wildlife. Lying as it does in the very heart of the Delta, the Jao Concession embodies all the magic and mystique of the Okavango. Narrow water channels cut their way through the papyrus and reed beds in the permanent delta to the north and east of the Concession, providing the perfect environment for the elusive sitatunga and the rare Pel's Fishing-Owl. Beautiful lush palm islands dot the water, begging to be explored; Jacana Camp is built on one such lush and thickly forested island. In the central region of the concession, vast open floodplains provide some of the most stunning scenery of the region, with beautiful islands fringed with riverine forests. Further west the area gets progressively dryer and Hunda Island, which is the tip of a large 'sand tongue,' is the largest area of dry land in the vicinity during the flood season. Hunda Island has sandveld vegetation supporting many species of nutritious acacia and grewia shrubs which provide excellent browsing. It is perhaps the birds for which the true wetland areas of the Okavango are best known however. The largest concentrations of endangered Wattled Crane are found in this area and Slaty Egrets, Rosy-throated Longclaws and African Skimmer are some of the specials that can be seen. Hallowed species such as Pel's Fishing-Owl and Slaty Egret are found alongside more conspicuous and commonly seen Coppery-tailed Coucal, Pygmy Goose, while the specialised African Skimmer (from which Wilderness Safaris takes its logo) may be seen on the larger lagoons and channels. The concession is set in the most densely populated wetland area for sitatunga antelope and red lechwe, and of course hippo and crocodile are regularly sighted. In the dry season lechwe, tsessebe, elephant, wildebeest and zebra occur here, and lion, cheetah and leopard are often sighted on the floodplains. The lion prides in this area have been extensively studied in recent years, thereby building up a more intimate knowledge of their behaviour. Jao Concession holder, David Kays, is a member of the Tubu Joint Management Committee which he was involved in launching together with the University of Botswana under the auspices of the Biokavango Project. The aim of this committee is to reduce conflict between the community and the Concession - specifically with regard to curbing poaching and over-fishing. We hope to assist the community with developing tourism ventures in their area. David and Cathy Kays and their families and Kingsley Mogalakwe are the long-term leaseholders of Jao Reserve. The Kays are one of Maun's oldest families. David's great grandfather first came to Ngamiland in 1887. In 1912 the Kays family settled in Tsau, at that time the headquarters of the Batawana tribe (Maun was not yet founded). When the Batawana tribe decided to establish a new village at Maun and move its headquarters there in the mid-1920's, the Kays family moved with them. David's father, Ronnie, was instrumental in advising the Batawana Tribal Authorities on the formation of Moremi Game Reserve and assisted in the demarcation of the reserve's boundaries. Kingsley Mogalakwe is from a prominent and well-known Maun family. His uncle, Montsho Mogalakwe, was also instrumental in the formation of Moremi Game Reserve and has now retired from service in Maun as the deputy chief for Ngamiland. Like all families raised in and around the Okavango, wildlife was in their blood, and they spent most of their lives out in the bush. When they won the rights for the Jao Reserve in the recent tender process, they were determined to make this Botswana's finest reserve. They turned their backs on hunting, even though it is allowed in this reserve.